Ugly, but probably a decent typer. Notice wear mark on space bar. After I had blogged about the Packard, collector Richard Polt commented that it looked a lot like a late-model clone of the Hermes Baby, manufactured by Montana SpA of Turin, Italy. Indeed! According to Will Davis, Montana was launched in 1950 to produce “licensed-built copies of the early version of the Hermes Baby.”2 These machines were “perfect” copies, but, subsequently, the quality would decline. I can certainly attest that later Montanas are poorly made. The body of mine simply snaps into the base, and its components feel insubstantial. That said, judging from wear on the space bar, it seems it was a serviceable typer. Someone got good use out of it. But Packard? Davis commented on my original posting saying he knew “of examples of importers simply picking familiar but untrademarked names to apply to foreign-made typewriters for sale in the U.S.”4 That is likely the case. As it turns out, Montana marketed its machines under several familiar names, including Vornado, Carlton and Viking, in addition to Packard and Montana. Metallic labels are generally affixed to areas designed for generic branding. Update, Jan. 25, 2014: I’ve found ads for this machine, which date it to 1967. See “Advertisements” at the bottom of the post. Offered on eBay. At $49 (starting bid) it is, in my opinion, overvalued. The styling of the logo is far more appealing on this machine than on the Packard. The names selected by Montana, including the company name itself, are cleverly chosen. 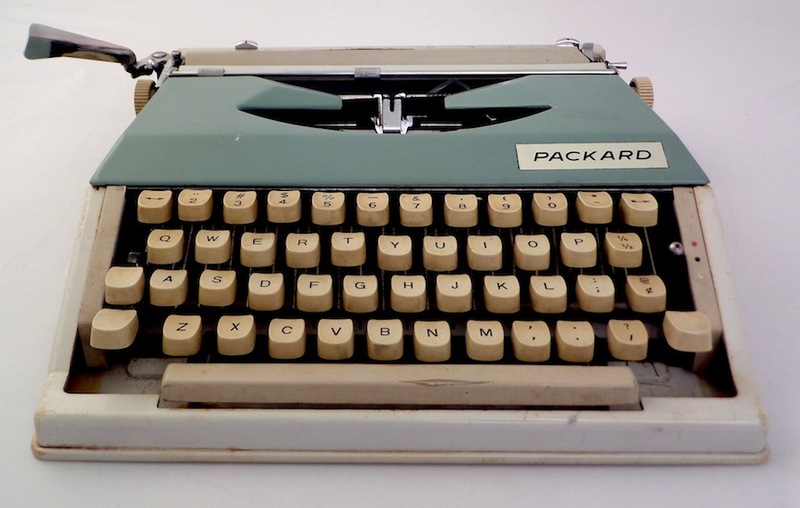 Apart from “Made in Italy,” inscribed on the back of the typewriters, one would never suspect Italian ownership. Viking has strong North American associations — think Minnesota Vikings. Carlton is a common name for U.S. towns and cities. Several companies bear that mark. Packard was once the name of an American automobile manufacturer. 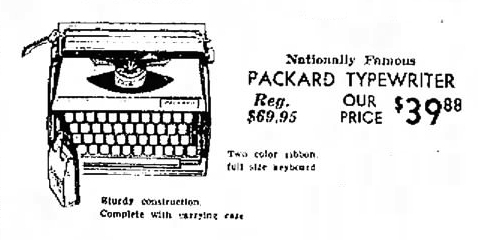 Also, the label on the Packard typewriter seems an obvious attempt to imitate HP’s modern styling. Vornado is associated with fans (for obvious reasons). It is also the name of a realty company that has holdings in departments stores. Originally, Vornado manufactured kitchen appliances. This last point is striking. In 1960, Vornado was a discount department store chain located in the East Coast.5 If I were to hazard a guess, I’d say the Montana was sometimes branded for sale at Vornado stores. But that is only a guess. 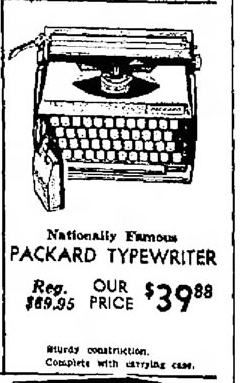 I haven’t been able to locate an advertisement for any of the branded machines of the Montana typewriter company. To note, Two Guys acquired Vornado in 1960, and later Two Guys became Vornado Realty.6 The Packard, or Montana, or Vornado, or Carlton would have certainly been at home at a discount department store. 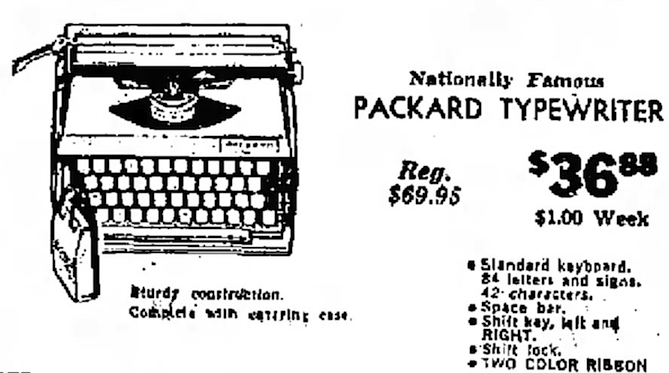 Update, Jan. 25, 2014: I finally located advertisements for the Packard typewriter. 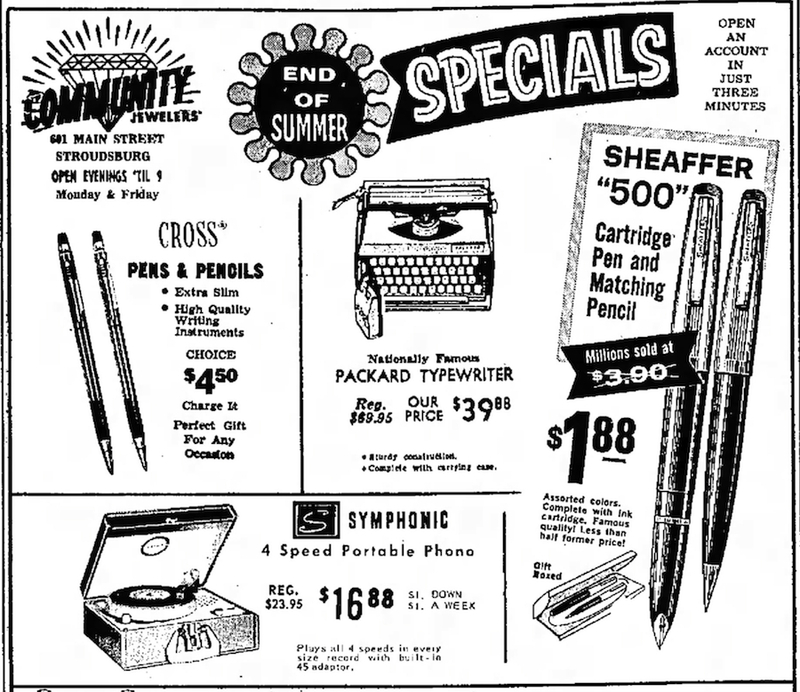 All are from Community Jewelers in Stroudsburg, Pennsylvania, placed in The Pocono Record in 1967. 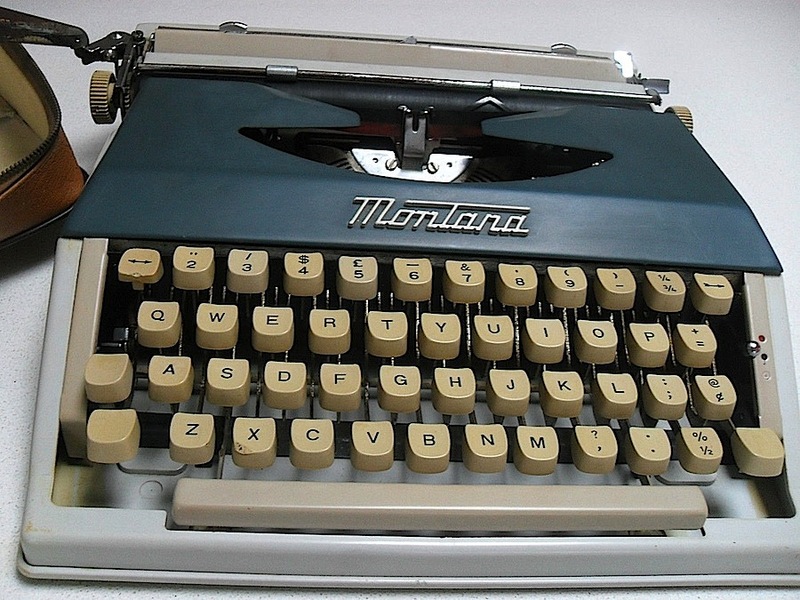 Montana is listed at TypewriterDatabase.com, which mentions several other brand names including Astoria (Montana), Iris, Mirian, Pontiac Minor, and Simtype Baby. Robert Messenger comments on these brand names here. Thanks. I’ve added my Packard to the database. Today, it seems odd that they’d want to hide Italian ownership – surely better to use it as a selling point and be more exotic than “Carlton” and “Packard”. My thinking is that they wanted to achieve brand recognition quickly by associating their product with common company names. For budget machines, probably not a bad idea, as it required little advertising to accomplish.